2002 Swing Seat Construcrion, Coordination Model I shown at Trapholt, and Art Parade /Kunstparade, Copenhagen arranged by Dorte Buchwald, Lone Bank, Christina Hamre and Tania Rau. 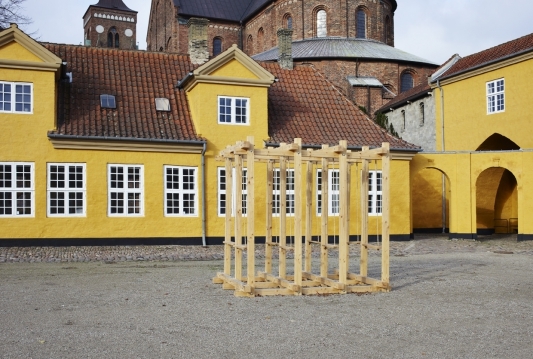 Swing Seat Construction is Haslund’s first coordination model and was her contribution to the Copenhagen Art Parade (Kunstparade 2002). 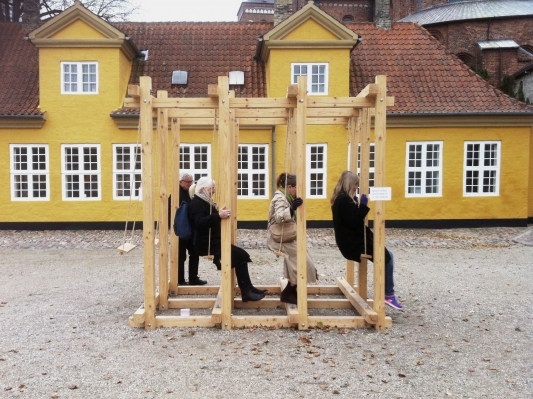 Swing Seat Construction consists of a large wooden frame made of unprocessed timber holding two rows of swings, four in each, situated so close that people must swing in unison in order not to collide. 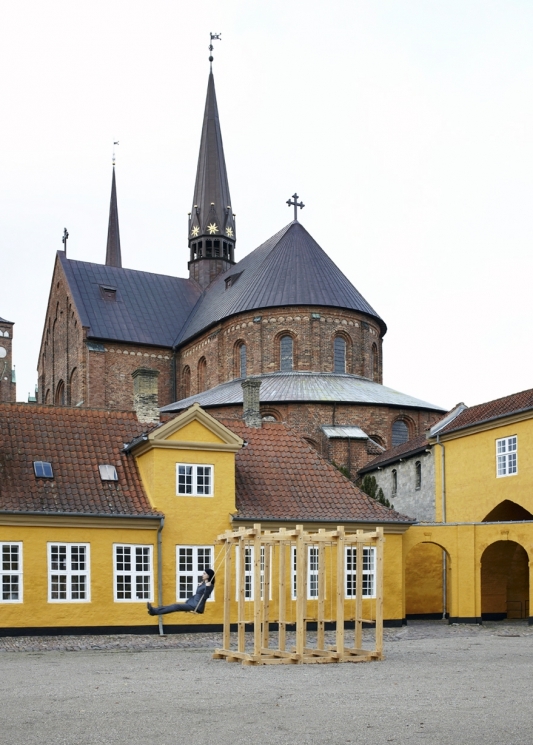 The Art Parade was hosted by Lone Bank, Christina Hamre, Dorthe Buchwald and Tanja Rau from the The Royal Academy of Fine Art (DK) and started in the Charlottenborg Courtyard and crossed the city of Copenhagen to the Enghave Park in the Vesterbro district. The parade stopped off on centrally located Nytorv/ Gammeltorv and at Skt. Hans Torv in the Nørrebro district. The Swing Seat Constriction was utilised on these locations. A team of six people wearing yellow hats lowered and raised the swing on a big trolley that transported the swing during the parade. Swing Seat Construction and a slow-motion documentation video of the parade was shown at the Konglomerat at Trapholt. 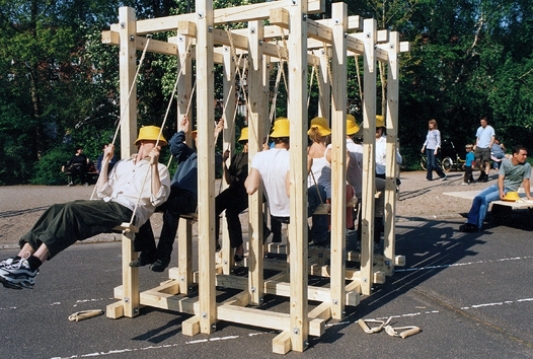 In the summer of 2002 the exhibition ”Konglomerat” was shown at Trapholt presenting the sculpture students at the Royal Academy of Fine Art (…) For this exhibition Molly Haslund created a so-called “Coordination Model”; a large wooden frame holding two rows of swings – 8 in all - hanging so close that people needed to coordinate their swinging in order not to collide. The swing was made of unprocessed timber and appeared as a sculpture - also when unused. It was partly identifiable as a toy (that swings are) but it also became alienated within the museum framing. The close hanging of the swings and the frame itself created a defined and new space for the swings. It was not possible to experiment with the swings’ force of gravity, as a lack if control or coordination would result in collisions and accidents. In this way Haslund has created a piece that seems inaccessible and it poses a number of interesting and existential questions.